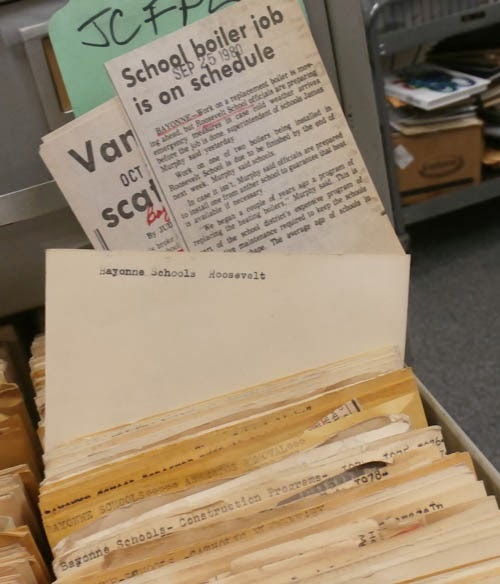 When Jersey City’s Journal Square lost its Journal, the New Jersey Room at the Jersey City Library, main branch acquired a new archive of old news. The Jersey Journal recently moved to Secaucus, New Jersey, because why should newspaper offices actually be located in the nerve center of the city reporters cover when they can reside in an office park constructed in the swamplands. 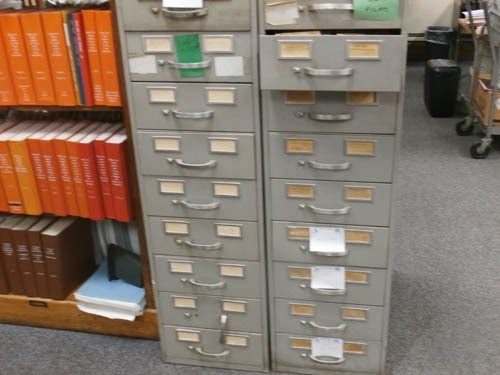 Prior to the move, the paper donated a vast archive – 18 metal filing cabinets, about five feet tall, 18 drawers in each – of newspaper clippings from the Hudson Dispatch, a long defunct newspaper, although sometimes still referenced by Dislocations. 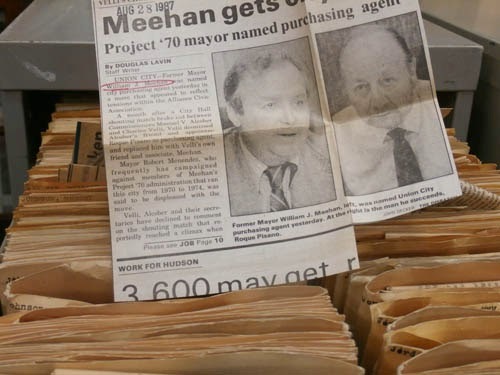 This archive is not just a comprehensive collection of life in Hudson County as seen through the journalistic lens of a daily newspaper, it is also a tribute to reportage, newsprint and paper. This archive is not just a vast resource of historical records, but a memorial to a way history used to be recorded. 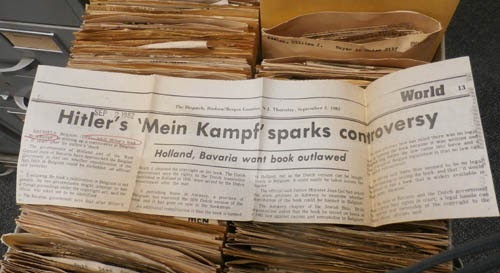 The archive is a memorial to the history of newspaper clips. In the drawers are min-manila folders, with sealed sides, essentially index card-sized pouches. They are arranged alphabetically by subject. Each story has been cut out and the subject is carefully circled or outlined in red pencil. 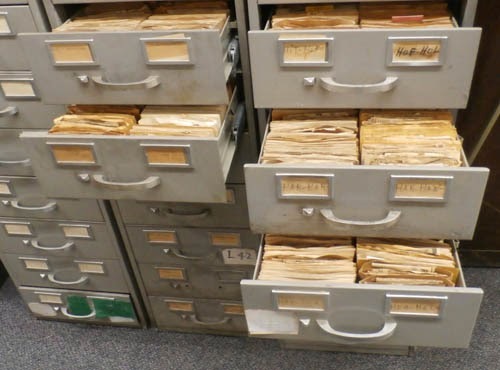 There’s got to be millions, certainly hundreds of thousands of stories here – I estimated well over a thousand clips in each drawer (there are two rows of manila folders stuffed with clips in each drawer). 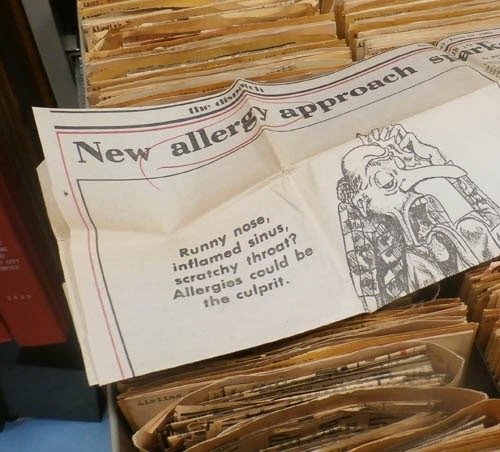 Opening the drawers, the acrid mustiness of yellowing newspaper wafts into your nostrils, slightly stinging your eyes, making them feel itchy. You are immediately aware that by peeking into the past, you actually are in what is left of that past. 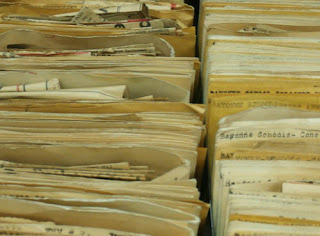 The subject lines are carefully typed – by typewriter – on the upper edge of the mini-manila folders. Some folders had a single clipping, must had several, efficiently folded to fit into the small pocket. The preciseness of the how the thin paper was shaped by the scissor, the circling or underlining of the subject, the origami-like attention paid to the folding are breathing examples of meticulousness. Little is known about this archive, just that it was in Jersey Journal offices and was not going with the move to the meadowlands. The Jersey City public library system saved it from being destroyed, these clips lost forever,. In the pre-internet, pre computer days, maintaining a clip file was standard operating procedure. A reporter gets assigned a story, he or she first sees what has been written about the subject previously. Stories eventually get indexed in a directory, which are used as a guide for micro-film (or micro-fiche!) 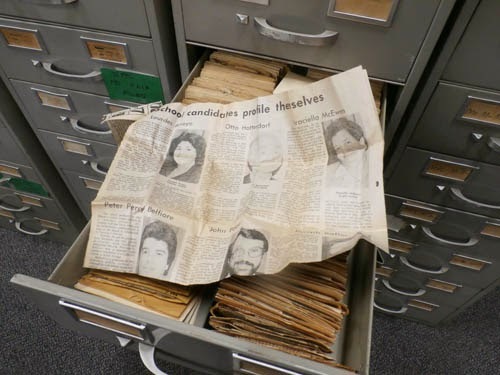 archives but for a busy newspaper room, a clipping library was more efficient. By the way, there were and still are, clipping services but back in the day (I’m old enough to have been at the tail end of this era) there were clipping services, subscribing to all sorts of publications and they had clients who needed to be alerted if their names were mentioned in the news no matter how small the circulation or exclusive the readership. Of course, in this internet era of Lexus/Nexus and google, such archives are as obsolete as the thin paper they are preserving. 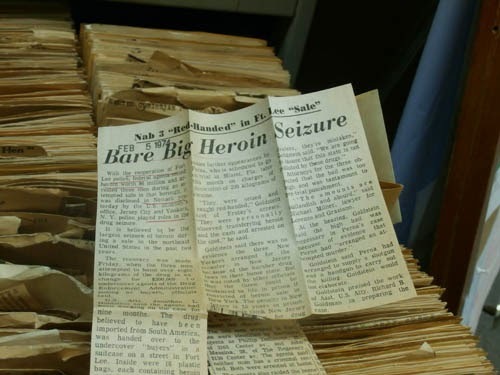 And while this Hudson Dispatch archive is comprehensive, it is also chronologically narrow and why it was previously owned by the Jersey Journal is also sort of a mystery too. 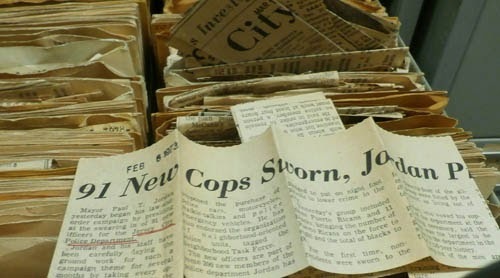 There are no clippings or files from the Jersey Journal or Star Ledger or other papers in the archive. 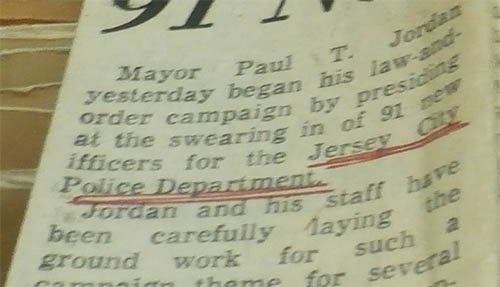 The Dispatch was founded in 1874 and lasted 117 years, it was purchased by the Jersey Journal around 1990 and the “jay jay” folded its one time competitor in 1991. The archives only spans 1970 to 1990, ending with the sale to the journal. Why only Dispatch clippings? What happened to the clippings prior to 1970? Was an archive kept and destroyed or was there a arbitrary “anno” year or start for this historical record. The archives was part of the acquisition of one newspaper by another, and its usefulness diminished with each passing year. The subjects of the clipping gradually becoming more and more historical than topical references. I imagine the bulky steel cabinets gathering dust, but no one had the heart to dispose of the contents. Maybe some researchers found them useful. 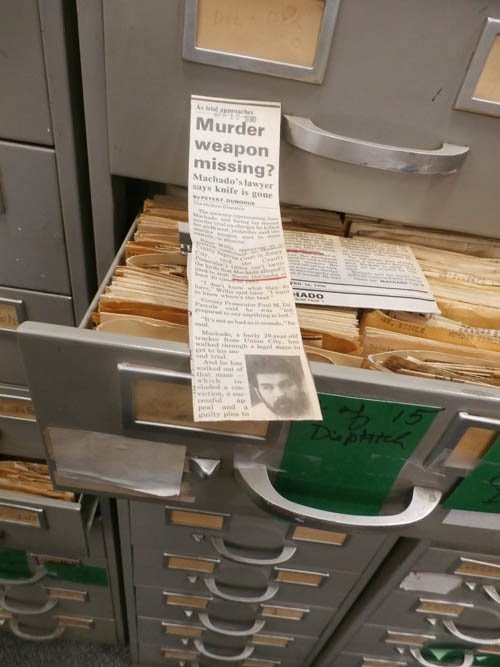 A reporter stuck on some facts or background decides to take a shot and goes through the old Hudson Dispatch archive and discovers an epiphany-inducing fact that opens up a great news story. I just randomly picked through the drawers, mainly for Dislocations pictures. 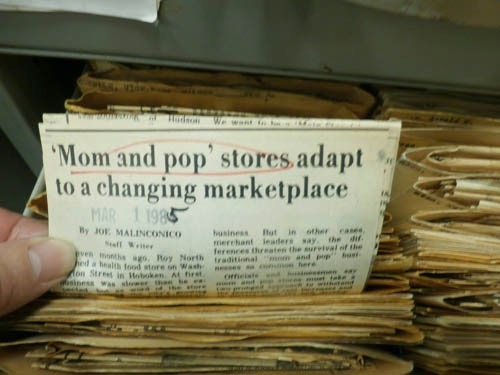 A 1985 story about “Mom & Pop” stores facing market changes, now 30 years later, where are those Hudson County shops, mostly gone, a few reimagined. Stepping back into history, yet so much of that history is the same stuff, now a different era. Our daily lives may change in detail, but only a few details. 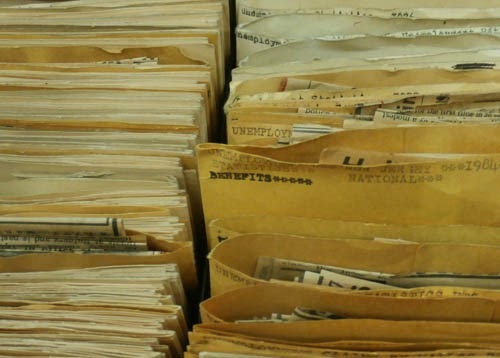 The clip files show how news is really not that new. Take a gander for yourself and see how they make you feel. 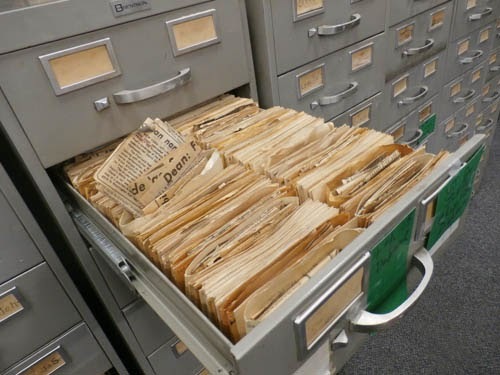 What a trove of history, and the fact that it will be preserved – the actual paper, the ultimate hard if slowly decaying copy – is a testament to the New Jersey Room’s commitment to Hudson County history, no matter how painstaking the task required by the staff or how incidental the material may seem to the cynical and ignorant. 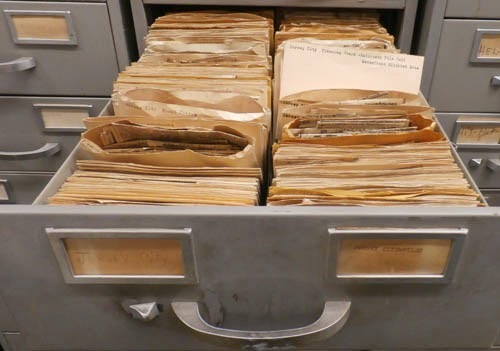 But good lord, what a task – the cataloging of the contents of the Hudson Dispatch files – every min-folder will have to be inspected, every clip unfolded and read, at least scanned, and recorded. I admire the diligence required, and I both pity and envy those doing this work, which is essentially, a present-day archivist archiving the archival work of an archivist of the pasts. Nostalgia for the 70s and 80s remains a permanent part of today’s popular culture, ironically this love of the past seems strongest among the Gen Yers who were either not born or still in infancy back then. Now there’s portal directly to how Hudson County actually lived that era. is there any talk about scanning these articles and publishing them online? What ever happened to these clippings?